Style Choker. These sapphires are very clean and transparent, with a great intensity and strong brilliance. Twenty seven white and fiery round brilliant cut bezel set diamonds are set in nine white gold sections. Stones: Diamonds VS1 clarity, G color total weight approx 1.22 carats. Large Oval Garnet: 15mm x 12mm approx. 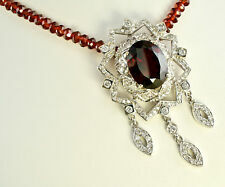 Necklace is made out of garnets. Style Choker. Hallmarks: DP 18k. 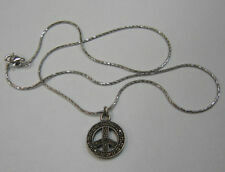 Weight: 25.9 grams including pendant and necklace. 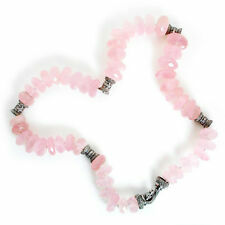 Metal: White GoldStyle: ChokerLength: 16 - 17.99"
Pink Quartz Choker Necklace with Diamonds 18K White Gold 17"
Love pink?. This unique and bold choker necklace is filled with 50 round faceted pink quartz gemstone's with 6 solid 18kt white gold diamond encrusted separators. There are 60 total round full cut diamonds (12 in each separator) weighing about. 30 carats total and graded G-H in color and SI1-SI2 in clarity. This necklace is made of 925 sterling silver. It's in good condition. Style Choker. AK 1/8/18 39-Y. This spectacular estate necklace is finely crafted in solid 18K Yellow gold by Gemlok. These pigeon blood red Rubies are very clean and transparent, with a great intensity and strong brilliance. Seven round brilliant cut diamonds are estimated to be very clean VVS2 clarity and G color totaling. 70 carat. 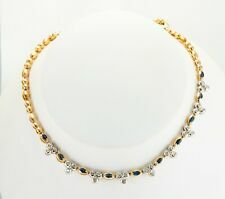 Metal: Yellow GoldStyle: ChokerLength: 16 - 17.99"
Style Choker. 84 round brilliant cut diamonds are estimated to be VS1 clarity and HI color for the total 2.52 carats. This piece weighs 52.3 grams.Great estate condition. Secondary Stone Diamond. Main Stone Color Green. Style Choker. Country/Region of Manufacture Thailand. STERLING SILVER. Glittering round diamonds are incredibly linked between the alternating sapphires. Round diamonds accent the focal point, an oval luscious blue sapphire. Below the pendant is a charming round blue sapphire that is prong set. Sterling silver green onyx necklace. This graduated piece consists of natural green onyx beads, alternated with sterling silver beads. Style Choker. Main Stone onyx. Our specialty is bringing you unique and high quality jewelry at unbeatable prices. Carat (Ct) - Topazio azzurro Ct 2.12 - Diamanti Pt 1. Gioielleria Tanini was born in 1985 and is family run. Diamond Distribution Centre. Features_ - Natural gems. Tanini Jewellery’s online sales service is specialised in watches and jewellery. The gems are of an excellent saturated color without visible pyrite or calcite inclusions - very fine quality lapis lazuli. Small gem beads and 14K gold round beads are woven into chevron pattern on one side, reversible to all-green malachite side. Gioielleria Tanini was born in 1985 and is family run. Diamond Distribution Centre. Features_ - Natural gems. Line - La Gemma del Cielo. Wire transfer. Material - Silver 925/1000. Tanini Jewellery’s online sales service is specialised in watches and jewellery. Free Custom Ring Sizes. We will try our absolute best to resolve any problems that you may have. All our products are of high quality and jewelry at reasonable prices. As we buy in bulk and have our own Factory so it makes you save around 75%. MADE WITH 14K WHITE GOLD. 585. ALL STONES ARE HAND SET CREATED WHITE SAPPHIRES FOR THE REAL DIAMOND LOOK & SPARKLE! FREE JEWELRY BOX INCLUDED. Style Choker. COLOR: SILVER TONE. Main Stone Sapphire. Each faceted is bead 8mm. Sterling silver clasp and silver beads. Each bead 10mm. Sterling silver clasp and silver beads. Each faceted is bead 7mm. Solid Sterling silver clasp. Large beaded real coral designer handmade necklace/choker with solid Sterling silver Daisy toggle clasp. Aquamarine briolette 12mm long. Stunning illusion necklace. Large beaded real coral designer handmade necklace/choker with solid Sterling silver toggle clasp.